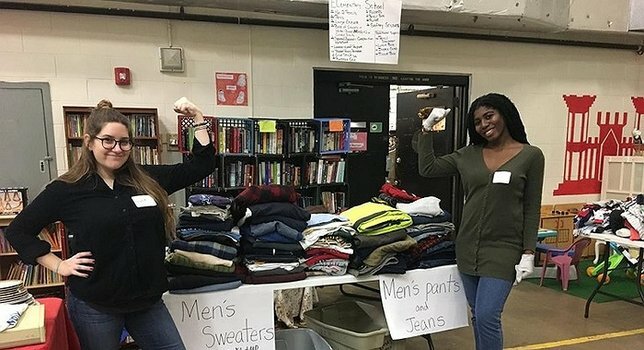 During the month of December, Suffolk County Executive Steve Bellone conducted a county-wide coat drive for those who are most in need this winter. Each January, LICH coordinates the Point-in-Time Count of sheltered and unsheltered homeless men, women and children in Nassau and Suffolk Counties. During the outreach efforts homeless kits are distributed to those in need. Photo by: Long Island Coalition for the Homeless, via Facebook. Amityville, NY - January 4, 2017 - During the month of December, Suffolk County Executive Steve Bellone conducted a county-wide coat drive for those who are most in need this winter. The Executive’s Team distributed boxes in local government offices for the collection. Through their efforts the coat drive collected over 400 coats which will be given to the Long Island Coalition for the Homeless for distribution. Each January, the Long Island Coalition for the Homeless coordinates the Point-in-Time Count of sheltered and unsheltered homeless men, women and children in Nassau and Suffolk Counties. During the outreach efforts homeless kits, including coats and other essential items, are distributed to those in need. “The purpose of the count is not only to get a grasp on the number of homeless folks living within our Counties, but to further engage those who are homeless, provide them with assistance and essential items, and hopefully begin plans to get them stably housed. We are so grateful to Suffolk County Executive Steve Bellone and everyone who participated to make this drive such a success…these coats, and our engagement efforts, may literally save live,” said Greta Guarton, Executive Director of the Long Island Coalition for the Homeless. The coats will be counted and sorted during the Executive Bellone’s Coat Count Evening. The event will host a press conference held at the Amityville Community Resource Center, 600 Albany Ave, Amityville NY 11701, on January 5 th from 4PM to 7PM. For more information about the Long Island Coalition for the Homeless and how to get involved visit www.addressthehomeless.org. Subject: LongIsland.com - Your Name sent you Article details of "Suffolk County Executive Steve Bellone's County-Wide Coat Drive Collects Over 400 Coats for LICH"